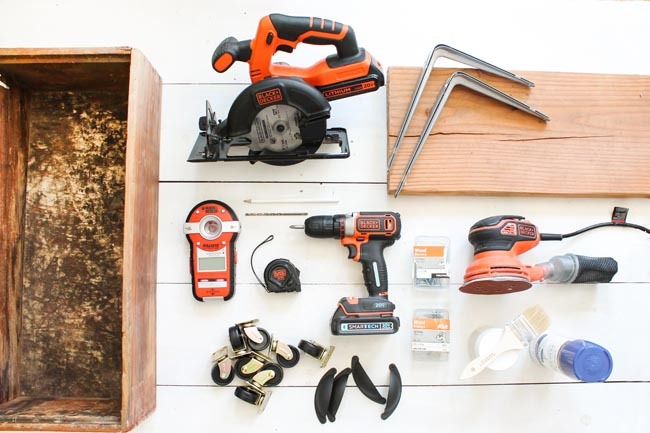 Are you sure you want to remove "DIY Kitchen Recycling Station" from My Projects? Upcycle to recycle: Use repurposed and salvaged materials to turn a corner of your kitchen or pantry into a recycling center. Curbed furniture and reclaimed wood can add instant character to your home with just a little cleaning, sanding and light refinishing. This budget-friendly makeover won't take you more than an afternoon and is a fun project the whole family can tackle together. 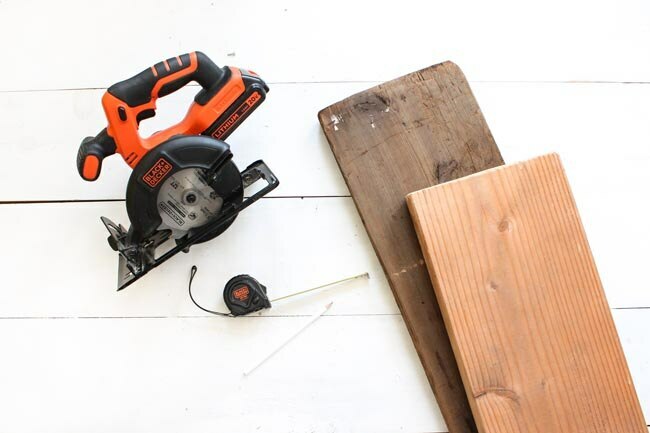 Cut two shelf boards to length at 48" from reclaimed wood, using the BLACK+DECKER 20V MAX* 5-1/2 in. Circular Saw. 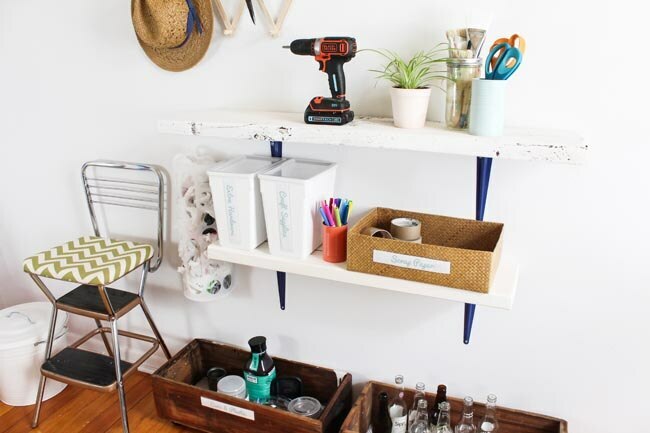 You can make your shelves longer or shorter, as desired, but they should be at least 36" long so they can span across three walls studs, which are typically spaced 16" from center to center. 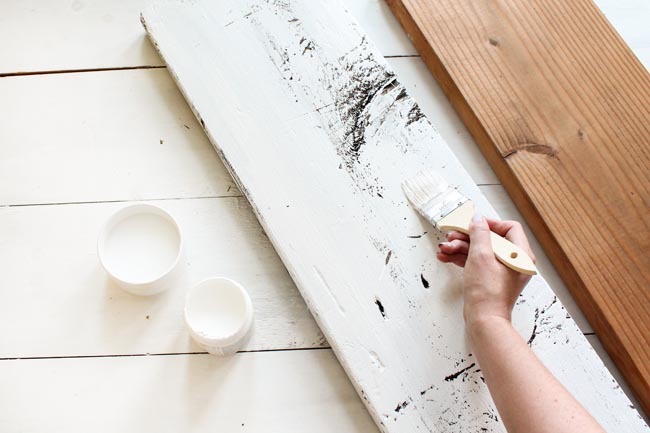 Enhance the natural beauty of old, weathered wood shelf boards by painting them lightly with an interior paint that contrasts with the existing stain or paint color. 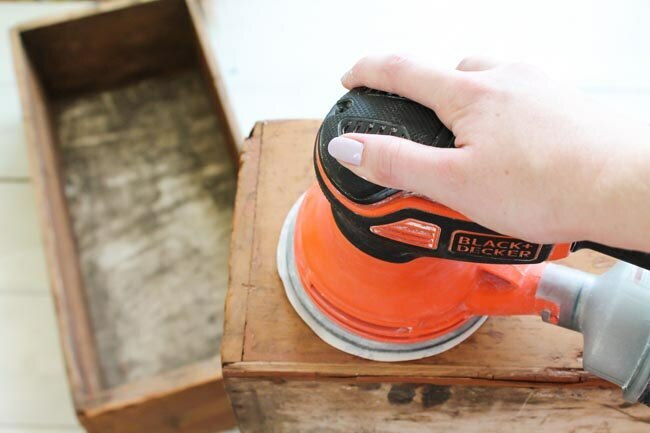 After the paint dries you can hand-sand the edges to maintain the rustic look with a piece of 100-grit sandpaper. Alternatively, you can stain your wood a natural color by brushing on stain and immediately wiping away excess with a rag. If your wood pieces show different degrees of weathering, try to match the color of the stain to help the pieces look like they have similar origins. You can find a wide range of tints and stains at your local hardware store. WARNING: Old painted boards are likely to contain lead paint, which was commonly used in homes prior to 1980. If you don't know the origin of painted wood, have it tested for lead before using. Give basic shelf brackets a custom look with a quick coat of spray paint, adding a pop of color to your kitchen or pantry. 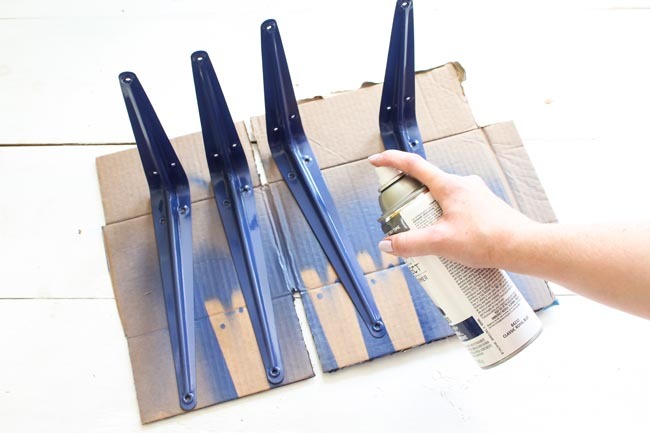 Apply two or three thin coats, as needed, allowing each coat to dry as directed by the manufacturer. 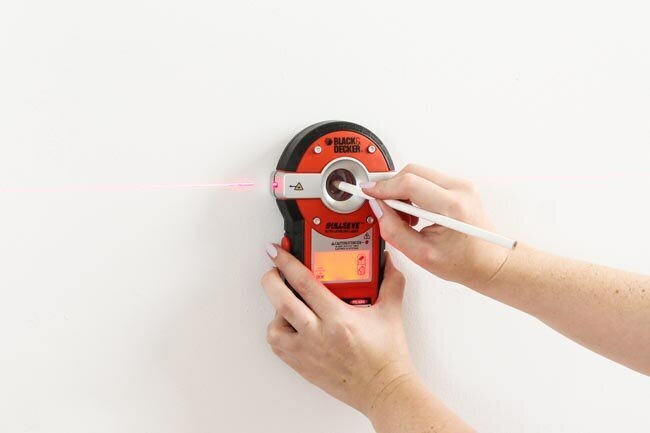 Use the BLACK+DECKER BullsEye® Auto Leveling Laser with Stud Sensor to locate a stud on the wall for the first shelf bracket of the lower shelf. Mark the center of the stud with a pencil at the desired height for the lower shelf. Locate and mark the stud for the second lower shelf bracket, which should be about 32" away from the first stud. Use the laser level to align the points and mark the location of the second bracket so the two brackets are at the same height. 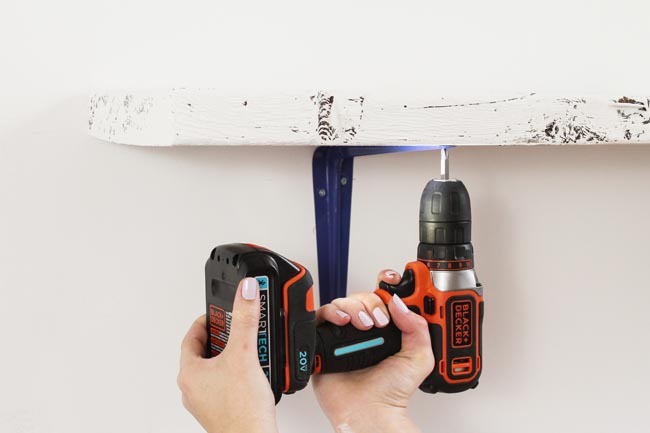 Fasten each of the two brackets to the wall with three 2" screws driven into the studs, using the BLACK+DECKER SMARTECH™ 20V MAX* Lithium Drill/Driver. Repeat the same process to install the two brackets for the upper shelf about 18" above the lower shelf or as desired. Place each shelf board on top of its brackets so it is centered from side to side. Drive three 1" wood screws through each bracket and into the bottom of the shelf to keep the shelf from sliding or tipping. Old dresser drawers are great for repurposing as sturdy storage. 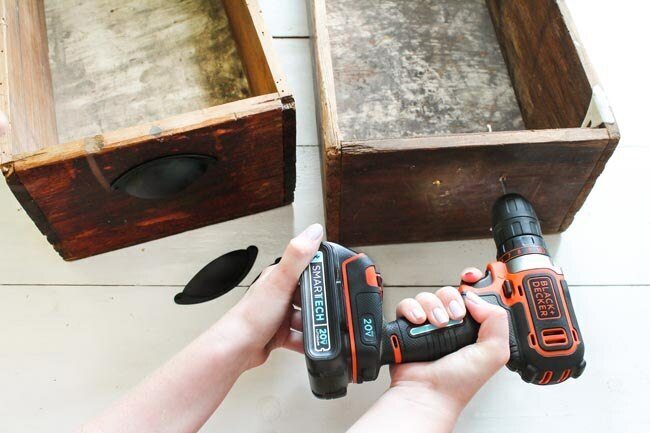 Remove any existing hardware from the drawers and use the BLACK+DECKER 5 in. Random Orbit Sander and an 80-grit sandpaper pad to remove the top layer of old faded wood or finish to reveal the wood underneath. If you're sticking with a rustic look just sand lightly in certain areas to maintain the original character of the worn wood. Wipe down the drawers with dish soap and water to remove dust and grime, and allow the wood to dry. TIP: If the interior bottoms of your drawers are badly stained, line them with scraps of wallpaper or shelf paper from a previous project. It's a great way to use up those pretty remnants you don't want to throw out. Create easy-to-grab handles for your rolling storage bins by adding drawer pulls left over from a remodeling project or purchased secondhand. Center the drawer pulls on the drawer fronts, about 2" down from the top of the drawer and mark the mounting hole locations. 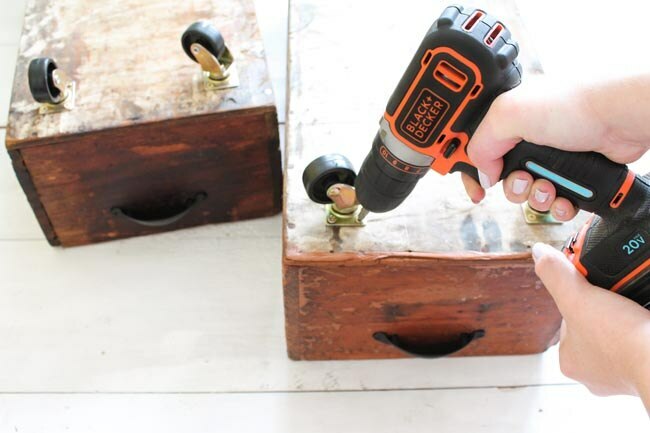 Drill the holes with a drill bit that's the same size as your drawer pulls' bolts, and install the pulls with the provided bolts. Flip the drawers upside down and place a 1-5/8" caster in each corner, about 1" from the adjacent side edges. Make sure the wheel plate is square with the drawer sides. Fasten each cast with four 1/2" wood screws. Print out custom labels to clearly designate bins for specific recyclables, or stencil large letters with paint on the bin fronts. Store essential crafting materials in bins along with your recycling to encourage kids to use their imagination and repurpose recycled packaging into creative art projects.